Like televisions, not every monitor is created equal. This also applies to monitors designed for photography or any other related purposes. However, choosing the right monitor for specific tasks can be challenging if you don't know where to look. Which is why we’re here to make your choices easier by listing these 7 different monitors that might suit your needs. 14-bit 3D Look Up Table, 31.5” display, 3840 x 2160 UHD resolution - these are some of the features that you will find in the BenQ SW320. Thanks to its great colour accuracy, it is the ideal monitor for photography and video editing. The monitor is equipped with a GamutDuo feature which allows one to compare visuals between different colour modes such as Adobe RGB and sRB. Built with the user's experience and convenience in mind, the monitor includes several features that highlight convenience including a Hotkey Puck to switch between colour modes and a shading hood to block out glare projection onto the screen. It’s not always necessary to spend four figures for a good, professional-looking monitor to edit your photos. This certainly rings true for this budget-friendly BenQ GW2270H. With a 16:9 Full HD resolution and a flicker-free technology to help reduce eye fatigue, it is ideal for those who often work long hours in front of the screen. 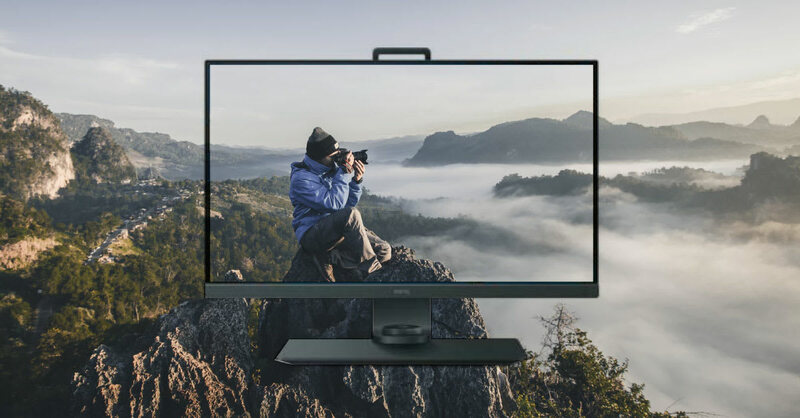 The BenQ SW271 comes with a wealth of features: a vibrant 4K UHD native resolution, a large 27” screen and a hotkey puck control which comes in handy for adjusting different colour modes such as sRGB and B&W. It also comes with a shading hood, ideal for minimising unwanted glare caused by ambient lights in the room. It’s no secret that photographers and graphic designers value the importance of colour correction. It is also part of a post-processing workflow that defines the overall look, tone and mood of an image. Enter the Dell P2715Q IPS 27” 4K UHD - a monitor that comes with a pre-adjusted colour format, set to 99% sRGB from the factory. There are also colour calibration choices available such as brightness & contrast and eight preset modes, which includes a custom colour setting that allows you to adjust the monitor using the RGB slider. True to its name, the Dell U2717D UltraSharp monitor comes with a vibrant QHD resolution and a bezel-less InfinityEdge display to ensure you get a maximum viewing experience. Flexibility is another key factor with this monitor; you can tilt and pivot the monitor up to 178° degrees using the adjustable stand at the back. Colour gamut, colour accuracy and overall resolution play a crucial part when it comes to Photoshop editing. This is where the Asus MX279HR comes in. It boasts an AH-IPS screen technology, which helps to enhance the overall colour accuracy. The bezel-less monitor makes viewing a pleasure, and you can even adjust it to either in a horizontal or vertical angle. The Acer Predator XB271HU may have been built specifically for dedicated gamers, with essential gaming features such as the NVIDIA G-Sync’s smooth-as-butter refresh rate and NVIDIA ULMB technology that helps to reduce motion blur while improving visual clarity. Despite this, this monitor is also versatile enough if you are looking to edit your photos as well. After all, it boasts an IPS panel display which is widely preferred for photo editing due to its accuracy in colour reproduction.